This interactive book is a web quest for students taking the Matter Matters! iOS course on a digital device. 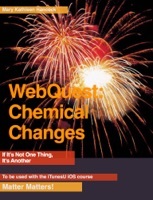 In this quest, you will find websites that will be useful as you study the chapter of the course on Chemical Changes.